I've claimed a spot in our bedroom and made it into a little crochet corner, a space just for me. It's nothing fancy - just an old chair, a table I borrowed from my Mom, my works-in-progress, and a good light - but it brings me happiness, calm, and a sense of accomplishment. I sit here in the early morning on weekends, if I can slip away in the afternoon, or before I go to bed at night, and crochet a few rounds. I think we all need a little time and space of our own, something that is ours alone and that feeds our soul. After I spend even a short while crafting - be it crochet or another type of craft - I feel so much calmer and at peace, so much more able to deal with and handle the busyness of life. And that is always a good thing. Also good is that slowly but surely, with more moments spent in my corner, I am making headway on my projects. And I need this. I need to feel like my creativity has a place to happen, that I can actually start and finish some of my projects. 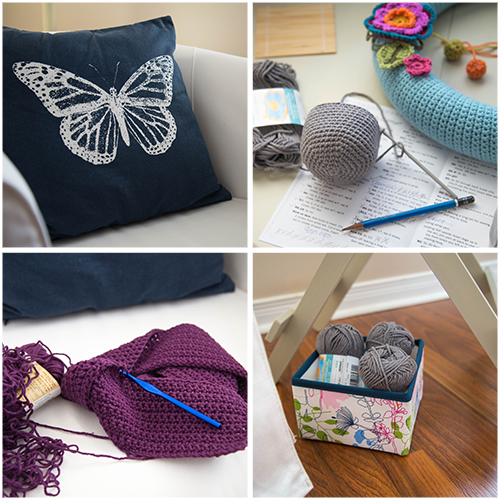 If I try and craft in the common areas of our home I am often distracted and/or drawn into something else, but here in my corner, I am alone with my hook and my yarn and I am able to finally get some of my projects done, and see some of my ideas come to life. My little crochet corner, my spot, thank you for all you've done so far to nourish my creative soul and bring some relaxation to my days. I hope to see you again very soon. I agree, Irune. It sounds nice crocheting on the balcony in nice weather..hope you are getting a chance to do that often.